Edwin Simpson, Sr., Charlie’s father, in the mid 1930’s. Charlie bought out the interest of his grandfather, Herbert’s siblings, who shared in the inheritance from founder Nathan B. Simpson, in 1969, and took over operations from his father in 1979. Since 1969 Echo Valley Farm has grown to nearly 256 acres of owned land and approximately 1,000 acres of leased land that is used for dairy operations, the planting and harvest of wheat, corn, soybeans, and pumpkins, and the latest venture, Echo Valley Corn Maze. 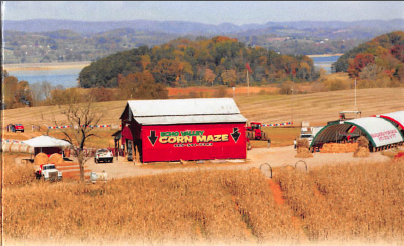 Charlie started the Corn Maze in 2007 as a way to supplement income in the economic downturn. Ever since it’s conception Echo Valley Corn Maze has grown each year by adding new facilities and attractions to its 50-acre landscape. 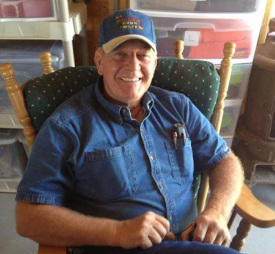 Becoming heavily involved in the Corn Maze operations and wanting to slow down a bit, Charlie handed over the operations of Echo Valley Farm to his son, Charles Parker Simpson, making Echo Valley Farm a 5th generation farm. Charlie still remains an active part of both Echo Valley Farm and Echo Valley Corn Maze, but happily shares the responsibilities of ownership and operations with Parker.